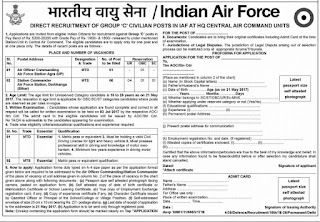 Indian Air Force Group C direct recruitment for the post of Multi tasking staff (MTS) and MTD in Air command units. 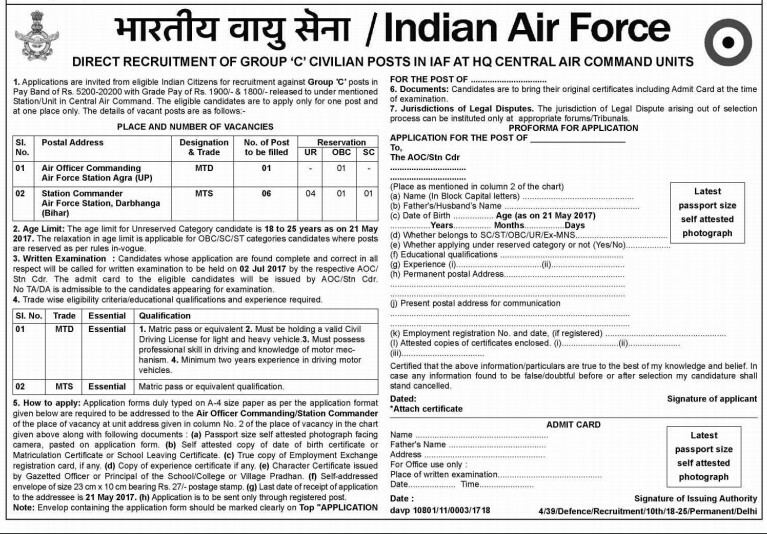 Age limit for Air Command Units Recruitment Bharti. 18 to 25 years as on 21 May 2017. Written Exam :- written exam to be held on 02 July 2017 by respective Air Force station commander. MTD :- 10th pass or equivalent and must have valid civilian Driving license for light and heavy vehicle. Also candidate must know motor mechanism. Two years driving experience required. MTS :- 10th pass or its equivalent examination. How to apply :- To know how to apply, complete detail and application form, please click on given photo and zoom it.